In March 2016, Vijay & Smita Patel made a £1m donation to De Montfort University to provide a series of bursaries for financially disadvantaged students and pay for state of the art, specialist equipment for the university’s Pharmacy department. Dr & Mrs Patel said that they wanted to use their wealth to help students in financial need achieve their dreams at the alma mater which helped launch their careers. In recognition of this donation, the biggest single donation by individuals in the University’s history, De Montfort University have named their new faculty of Arts, Design and Humanities building after Dr Patel and a newly refurbished laboratory in the Faculty of Health and Life Sciences will be named after Mrs Patel. 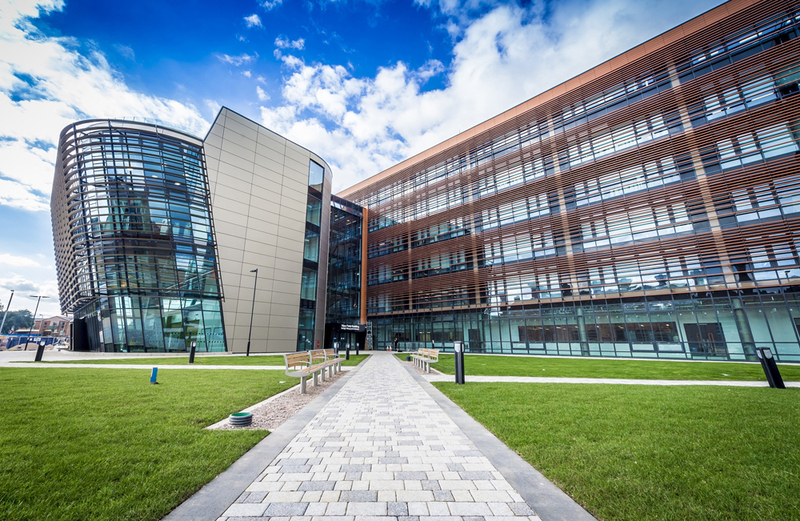 The Vijay Patel Building is the centrepiece of the £136 million Campus Transformation Project which will, when complete, provide DMU with one of the finest campuses in the country. The Vijay Patel Building will offer sector-leading facilities to students making it an unrivalled environment in which students can create and express. One of the main advantages of the new centre is that it will bring all of the art and design subjects, as well as their workshops, under one roof. In addition, the centre will have new exhibition facilities, giving an inspiring space in which to display both student and external artwork.